5-HTTLPR, back to the future, biology 101, biology and behavior, biology and culture, biology matters, booby alert!, different peoples is different (duh! ), drd4, further research is required, jury's still out, LHSGF, life histories, life history strategies, Life History Strategy Genetic Factor, life history traits, time orientation, what's this hbd business all about anyway?, where does culture come from? 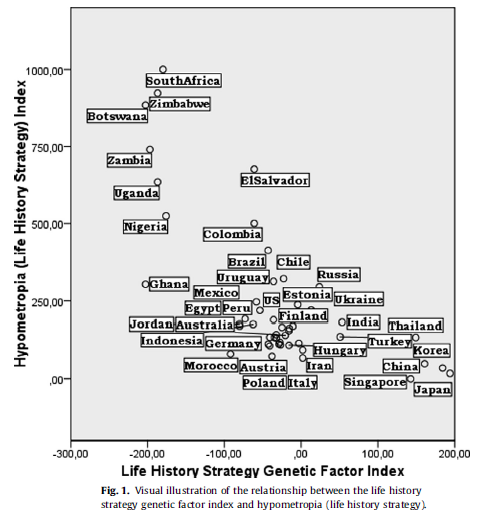 • Polymorphisms in three genes have been linked to aspects of life-history strategy. • National frequencies of these polymorphisms form a strong single genetic factor. 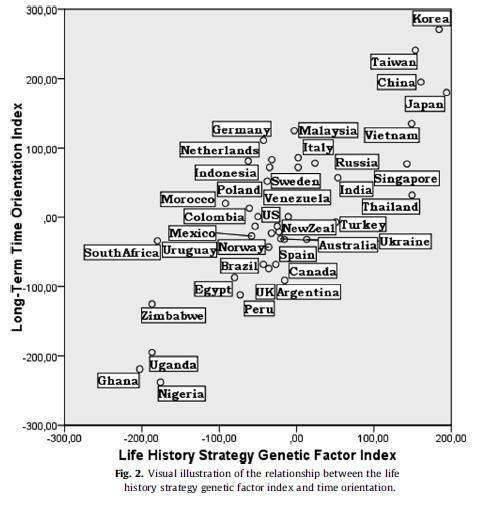 • The genetic factor is strongly associated with national differences in life-history strategy. • This association remains after controlling for national socioeconomic differences. “Life history strategy (LHS) theory explains differences in the allocation of an individual’s total bioenergetic and material resources between somatic effort (devoted to the survival of the individual) and reproductive effort (devoted to the production of offspring), as well as parenting effort (devoted to the survival of offspring) and mating effort (devoted to obtaining and retaining sexual partners) (Figueredo et al., 2005). Fast LHS (a focus on reproductive and mating effort) is positively associated with risktaking in animals (Ackerman, Eadie, & Moore, 2006) and humans (Figueredo et al., 2005). In addition to the individual-level studies, a number of nation-level measures associated with LHS have been proposed, relying mostly on national statistics about reproduction, violent crime, and cognitive ability or educational attainment (Meisenberg & Woodley, 2013; Minkov, 2013; Rushton & Templer, 2009; Templer, 2008). mr. billare objects to the paper on the grounds that, in some cases where data were lacking, the authors estimated the frequencies of the alleles based on the rates found in neighboring populations — neighboring populations that, perhaps, aren’t all that related to those for which there were no available data. that is not ideal, i agree — for example, estimating the national frequency of the DRD4 7-repeat for venezuela based on mexico’s frequency is…questionable. but i don’t think that their reference populations (i.e. the neighboring populations) which they used are that far off in most of the cases — at least not from a first glance at the paper. still, not ideal. definitely a weakness of the study. it’s early days, of course, and teh scientists simply just don’t know even half of the genes involved in our behavioral traits at this point in time. Further Research is RequiredTM! it’ll certainly be exciting when more data arrives! (^_^) this is an intriguing first step, though.